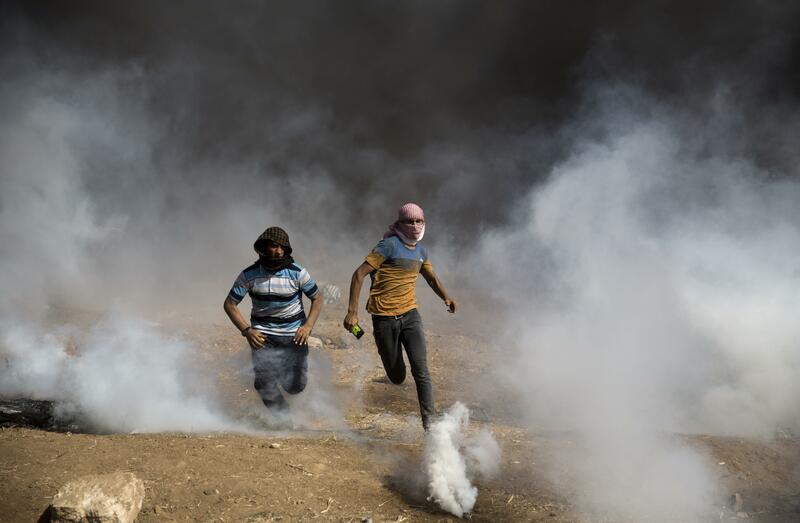 UPDATED: Fri., June 8, 2018, 7:42 p.m.
GAZA CITY, Gaza Strip – Israeli troops fired live rounds and tear gas as thousands of Palestinians protested near the Gaza border fence Friday, and at least four demonstrators were killed, including a teenage boy, with over 600 wounded, Gaza health officials said. French news agency Agence France-Presse said one of its photographers, Mohammed Abed al-Baba, was wounded at a mass rally after Israeli forces opened fire. AFP said al-Baba was wearing a press vest and helmet about 200 yards from the border when hurt. After Muslim prayers at noon Friday, thousands of Gaza residents streamed toward five protest tent camps that were erected more than two months ago, each several hundred yards from the fence. From there, smaller groups walked closer to it. Crowds of several dozen Palestinians could be seen approaching the fence constantly, as soldiers fired tear gas to scatter them. Some Palestinians launched kites rigged with incendiary devices, which were intercepted by small military drones. Snipers, perched about 50 yards from the fence and protected by sandbags and concrete barriers, frequently fired warning shots into the air. Published: June 8, 2018, 10:45 a.m. Updated: June 8, 2018, 7:42 p.m.